Join us for Events to raise awarness about the Upcoming Hearing. The "Hands Across the Toll Road" event scheduled for July 19th has been canceled. We want to hold this event in conjunction with the hearing. Since the hearing date/location is up in the air, we are holding off on the demonstration until the Federal Government confirms a new location. 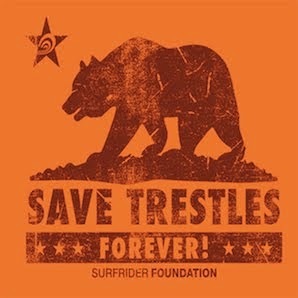 However, our Chapter network is still busy raising awareness about the Save Trestles campaign. They will be talking about the Save Trestles campaign at the following events to make sure local communities are aware of the campaign and inform people about the change in the venue of the public hearing. Please double check your local Chapter website for details. July 17: The Newport Chapter is hosting a Save Trestles art show at Havassy. July 24th: The West LA/Malibu Chapter is throwing their "Surfrider Summer Night at Air Conditioned" party and with a special Save Trestle theme. July 24-27: US Open Surf contest in Huntington Beach. Surfrider activists will be educating contest goers and also gathering signatures to present to the Secretary of Commerce. The San Diego Chapter of Surfrider recently took to the sky.....check out these savvy activists: click here And....coming to a TV station near you...our PSA regarding the July 25th hearing: click here Remember this is just a sampling.... There are several Chapters in Southern California that are keeping the pressure on the TCA by being visible in their communities. Newport Beach Chapter of the Surfrider Foundation--Trestles Benefit. This coming Thursday, July 17th, reknown artist Robb Havassy will bepresenting an art exhibition and benefit, featuring more than 30 newpaintings and sculptures. The event titled "Feminine Waves" will showcaseHavassy's unique fusion of color and motion and the interplay ofmulti-media depictions of the feminine form incorporated into fancifulsurf-scapes. The event, hosted by Newport Beach's legendary Sol Grill, (located at thebase of Newport Pier, next to Sharkey's), begins with an artist receptionfrom 6-7 pm, featuring complimentary food, Las Olas wine and Havassy's newsangria, Solgria. The show is open to the public from 6-11pm, with specialmusical performances by DJ Dave Onex from Elektrik Haze, as well an acousticset by Will Crum and other special musical guests. The "Feminine Waves" exhibition will feature art for sale as well as araffle with 100% of the proceeds of the raffle, going to benefit theSurfrider Foundation's, Newport Beach chapter. The raffle items includeSector9 skateboards and apparel, gear from Hurley, Oneill, Atwater,Robert August Surfboards, Havassy's art, sandals, new 2009 Surf Odysseycalendar, gift certificates from Spa Gregorie and Sol Grill, Las Olaswine, and much more.This benefit event will not only help to raise money for SurfriderFoundation, but also increase awareness for the crucial "Save Trestles"campaign to save the state park. Surfrider Foundation will be on hand toprovide information about the critical upcoming public hearing on thematter at UCI, July 25th. This hearing needs a huge show of public supportto stand against the private interests, namely the Transportation CorridorAuthority, that seeks to pave a toll road through an irreplaceableCalifornia resource.On June 25, the Secretary of Commerce announced that a public hearingregarding the controversial 241 Toll Road extension is scheduled to takeplace July 25 at the Bren Center on the campus of UC Irvine. This hearingmarks the next battle between the Transportation Corridor Authority (TCA)and opponents over the continuation of the road, which would lead to theclosure of the popular campgrounds at San Onofre State Park and spoiling ofthe San Mateo Creek. "The "Save Trestles, Save the State Park" campaign means so much to thesurfing community and surf industry. Imagine if we were to lose thesenatural resources! Thanks to Surfrider Foundation for their leadership infighting the building of the 241 Toll Road extension through the park. However, it is an expensive effort, and this event will help raise money tosupport the cause. Thank you." Bob Mignogna, former publisher of SurfingMagazine. For more information on the Save Trestles Campaign, go tohttp://www.savetrestles.org or http://www.surfrider.org.About Surfrider Foundation:The Surfrider Foundation is a non-profit grassroots organization dedicatedto the protection and enjoyment of our world's oceans, waves and beaches.Founded in 1984 by a handful of visionary surfers in Malibu, California,the Surfrider Foundation now maintains over 50,000 members and 80 chaptersworldwide. For more information on the Surfrider Foundation, go towww.surfrider.org.For More information about the "FEMININE WAVES" event go tohttp://www.havassyart.com and http://www.solgrill.com. Your Official Invite To The Biggest Hearing On Earth.